One doesn’t have to delve too deeply to see that, as a whole, fish biologists haven’t done a stellar job of sustaining fish populations…and I’m not just talking the U.S., but worldwide. It’s not necessarily our fault, however; it has a lot to do with psychology. Fish, for the most part, are out of sight and therefore out of mind. They also tend to be cold-blooded, which is not an endearing quality to the average person, and they definitely don’t have engaging eyelashes like Bambi or the majority of their other more alluring terrestrial counterparts. The fact is that people, because of human nature and inherent biases, just treat aquatic species differently. As a consequence, it’s estimated that approximately two-thirds of the predatory fish in the marine environment have drastically declined in the past 40 years – mostly from overfishing (don’t get me going about the annual senseless slaughter of over 30 million sharks, just for their fins!). Unfortunately, there are implications throughout the food chain beyond the desirable species that consumers like to eat; cascading effects can disrupt entire ecosystems. 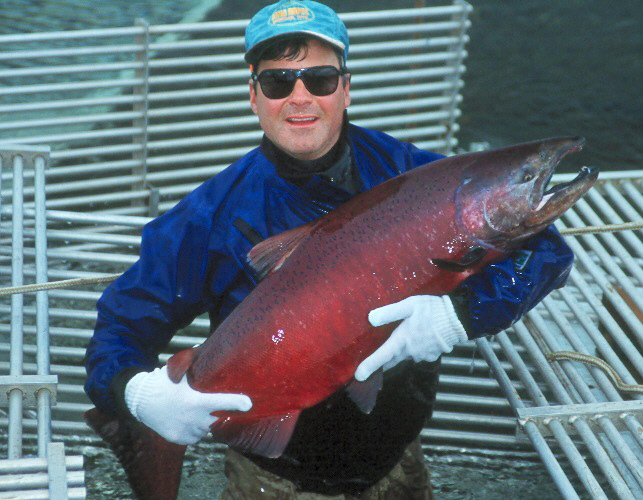 Given the predicted human population increase, the overall, long-term, downward trend in wild salmon abundance is nearly certain unless there are spectacular changes in the lifestyles of the region’s inhabitants. The author’s front yard – Aniak, AK. Other marine concerns include pollution, especially estuarial “dead zones” (e.g., the Gulf of Mexico at the mouth of the Mississippi River and Chesapeake Bay; however, there are over 140 worldwide), and possibly the most significant, the all-expansive threat of ocean acidification brought on by the increase of human-generated levels of CO2. If that’s not bad enough, fishes of the fresh water environs are actually doing worse – all because of a multitude of anthropogenic stressors (anthropos is Greek for man); some of those causes include the introduction of exotic species and habitat degradation or alteration, which includes water withdrawals, pollution, and dam construction (hydroelectric power is not the clean energy source it’s touted to be). Although fishes and other aquatic species and their ecosystems have always captivated my interests, environmental concerns don’t end at the water’s edge. Overall, biological diversity is declining at an alarming rate; so much so that conservation biologists estimate that the current extinction rate is over 1,000 times greater than if humans weren’t part of the equation. Subsequently, some scientists contend that we have left the Holocene epoch and entered the “Anthropocene” (in geologic parlance, Holocene means “wholly recent” and is used to designate the last 12,000 years of existence on our planet). It’s a little ironic because the Latin interpretation of our species name – Homo sapiens – means “man who knows” or “the wise ones.” Not to sound arrogant, but as a biologist, I firmly believe that, in general, we all need to wise up and realize that all of us, in one way or another, are irrevocably fouling our life-sustaining nest in a number of ways. And for those who contend that nature is resilient…you’re right, but it’s not infinitely resilient! Ever since returning to college a quarter century ago while in my mid-thirties to be a fish biologist with the naïve intent to “save the fishes”, most of my efforts have been focused on heightening people’s awareness of environmental issues. Unfortunately, in the big scheme of things, I’ve come up empty-handed and have wondered if anyone can make the difference that’s needed. It also doesn’t help that the average person has enough stress in their lives that they often tend to avoid bad news. Jon Franklin, a two-time Pulitzer Prize winner, had this to say in his book Writing for Story: Successful stories generally have happy endings because the public has a maudlin craving to believe that everything is quite all right when the world is obviously going to hell in a hand basket. Given that the extinction rate won’t be leveling off anytime soon, I’ve been on a personal crusade to make a game-changing difference regarding mankind’s attitude toward the environment. I started out by trying to write a book about my experiences and insights over the past decade…one that incorporates the humor that Mr. Wilde referred to. The plan was to take a critical and irreverent look at the human race and human nature from a fish’s perspective; this piscis’s appellation was to be Cyprinid Cynicalis (Cyprinidae is the taxonomic grouping for the minnow family – hopefully you get the drift of his last name). After numerous unsuccessful attempts to follow Mr. Franklin’s sage advice by climaxing with a cheerful ending, I asked myself if any book could actually succeed in turning the environmental tide these days…especially one based on the dire reality of the situation. I found myself asking, if Rachel Carson were alive today, would she have the influence that she did 50 years ago when she wrote her seminal book, Silent Spring, which launched modern environmentalism? Not possessing a strong propensity for prose, I pursued help in the form of someone either mentoring me or telling my story for me! After countless failed attempts, I came upon a gifted writer (Joe McGinniss) who had written a “vivid memoir” about his time in Alaska nearly 35 years ago that turned out to be a best-seller. Given the sorry state of publishing today, I see no possibility of getting a contract that would let me work with you on this. Reading is on the way out. The visual image is replacing the written word as the basic unit of communication. Let me put it this way, and I mean no disrespect: in the current publishing environment (and it will only worsen, not improve), even I can’t get a book deal. That’s after 12 books, six of which were NY Times best-sellers. I’m rooting for you, but there’s no way I can help you. I would advise you to apply your considerable and valuable energies elsewhere. And back to Robert Lackey’s contention that “spectacular changes in the lifestyles” are needed to restore salmon of the Pacific Northwest. Unfortunately, most things are a matter of scale, and the fish concerns are only a small part of bigger environmental quandaries, such as the loss of biological diversity and impending climate change. What, realistically, could reach a lot of people? I’ve heard it said that the only two forces that can change the way people think and behave are religion and the arts. I’m a fan of the late Stephen Covey – author of 7 Habits of Highly Effective People – who professed, “Begin with the end in mind.” Subsequently, the only thing that I believe that has the potential to reach the masses with the right message is a full-length motion picture. At the expense of sounding presumptuous, I think that my personal narrative, if told correctly, can get the average person to reflect on their place in the environment and never see themselves or the environment the same way again. Instead of having a mentor in the Forest Service, a fledgling fish biologist had a tormentor that set him up to fail at every possible juncture, both personally and professionally. His oppression – because of his insecurities brought on by a Napoleon complex – set our biologist on a 20-year path of misfortune and angst that ultimately ended in several debilitating bouts of anxiety and depression. However, it was a path that led to unique insights into why Homo sapiens—if we don’t take charge of ourselves psychologically—are incapable of averting widespread calamitous ecological and social disruption. I envision an amalgamation of A River Runs Through It, Patch Adams, Mr. Holland’s Opus, A Beautiful Mind, and Temple Grandin, with some Northern Exposure thrown in for humor so that you won’t kill me for telling you the truth…as per Mr. Wilde. It’s only when you understand my personal paradigm will you see that “my story” is not really mine per se – it’s the environment’s story – it’s the story of us all. If you are interested in helping to get this film produced or in learning more about my work, please visit my website.